Good Deed Flash Mobs are done to bring the community together and help people in need. We had the amazing opportunity to give a deserving family $10,000 to help change their life! It was such a HUGE and exciting event where we were able to get over 1,000 people to come out and dance in their honor. We danced to Lady Gaga’s hit single “Edge of Glory” as we surprised them at the Long Beach Marathon. Join FLASH MOB AMERICA, NATIONAL GEOGRAPHIC KIDS, and First Lady Michelle Obama on October 11-12 to break the Guinness World Record for the most people doing jumping jacks. Between 3 p.m. ET October 11 and 3 p.m. ET October 12, kids and adults can help break the record by doing one minute of jumping jacks. As the official Jumper in Chief, Mrs. Obama will kick off NATIONAL GEOGRAPHIC KIDS’ attempt to break the record. 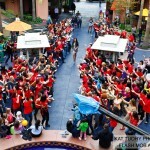 Learn The Bachelorette Flash Mob Dance!